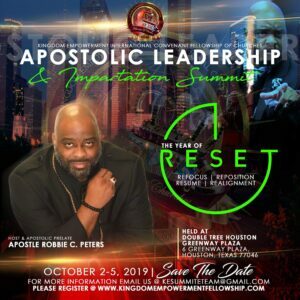 The 2019 Kingdom Empowerment Leadership & Impartation Summit will be held in Houston, Texas! from The Visionary, Apostle Robbie C Peters. HOTEL ACCOMMODATIONS: Click Here To Book Your Hotel Accommodations Online. Nightly room rates are $99 for double and king rooms. To book your hotel accommodations via phone, please contact the hotel directly at (713) 629-1200, referencing room block KESUMMIT2019. If you have any questions, please feel free to email the KE Summit 19 Executive Team at kesummiteteam@gmail.com!